The World's popular online store Amazon launches a new feature called #AmazonCart, which allows users to add products to Amazon shopping cart without leaving Twitter. That means when you tweet the Amazon product link with #AmazonCart hashtag, the product will be added automatically to your Amazon shopping cart. Late you can buy the items when you have free time. To use this feature first you have to connect your Amazon account account by clicking "Get Started" button on this page. Then Retweet any tweet containing Amazon product link, now the product will be added to your Amazon shopping cart, like this you can add more products to your shopping cart right from Twitter. 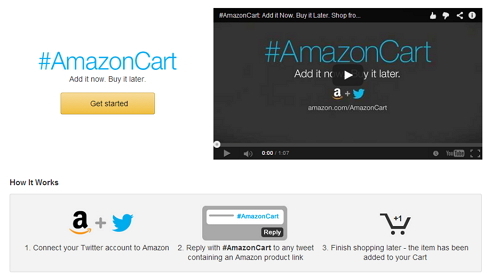 And you will receive the confirmation message from Amazon via Twitter and your registered Email. Then you can buy the product at anytime on Amazon when you have free time.